Reggae Rising was birthed at a meeting, which included some of the original founders, staff and coordinators of a Reggae festival in Southern Humboldt County. These community members and local business owners have lovingly and successfully worked together for the past 23 years in Piercy, California, on the Eel River, to produce "the best Reggae festival in the world." 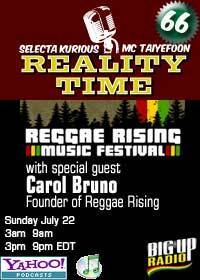 We are dedicated to making Reggae Rising a new and important destination for our longtime friends and audience. Please join us this year at the Dimmick Ranch and French’s Camp for three magical days of music and fun, in a beautiful natural setting along the Eel River.